Popcorn… who doesn’t love popcorn? 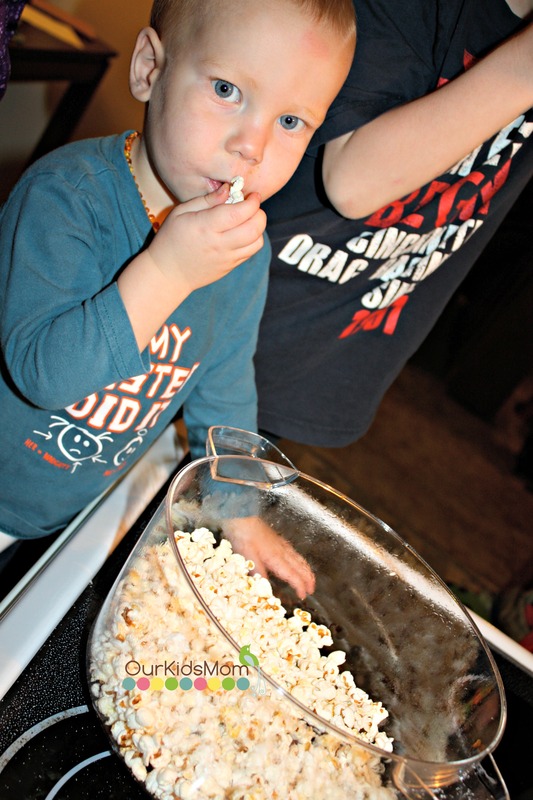 My kids have a nose for popcorn, the moment that popcorn starts popping my kids come running! They just simply love it. I have been buying microwave popcorn, but I have wanted to switch back to an air popper because I worry about what’s in the microwave bag. 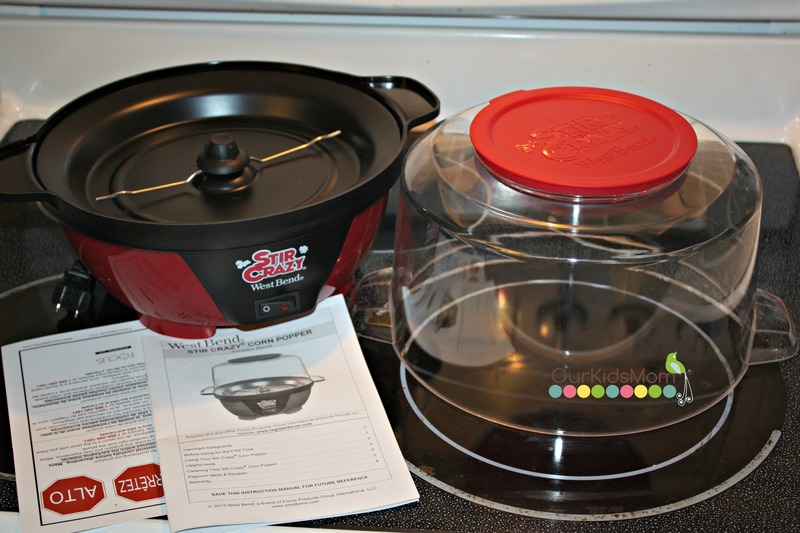 I was asked to review the West Bend Stir Crazy popcorn popper and of course I jumped on the chance. I knew my kids would love it. Opening the box it comes with the popcorn maker, which is two pieces. I was hoping it would come with a sample of popcorn to get you started, but luckily my mom saved the night and brought come popcorn. 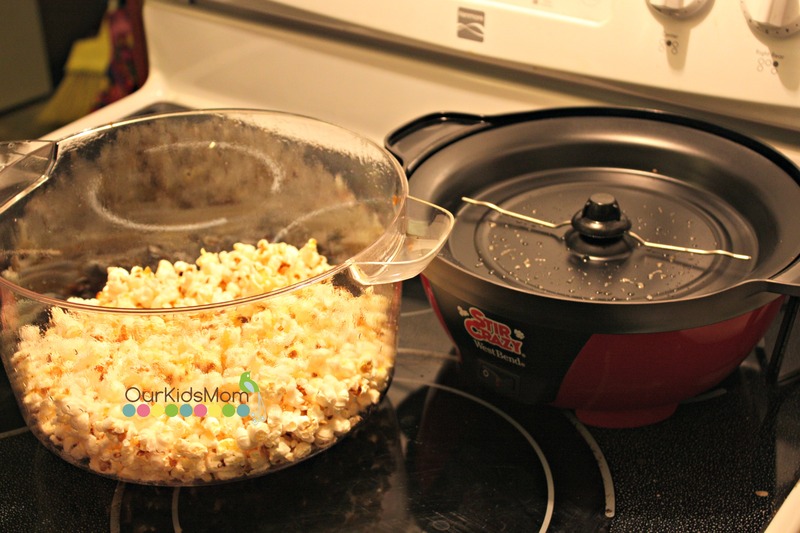 For the small amount I was making it took 1 tablespoon of oil in the bottom and then I spread 1/3 cup of popcorn kernels in the bottom. Next I placed the lid on, making sure to line up the handles so it’s secure. The lid doesn’t lock into place at all so you need to make sure your (curious and excited) kids don’t try to remove the lid. The last thing to do is turn on your popper and let it go. The arm rotates around keeping the popcorn moving. 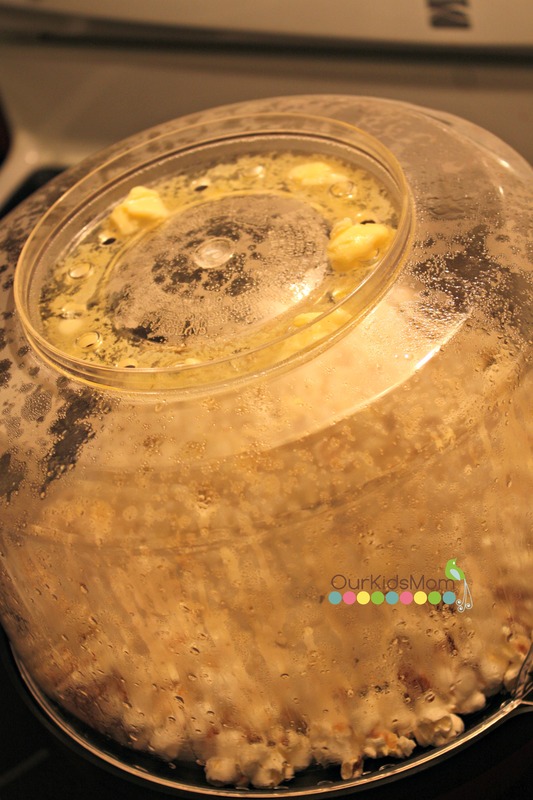 It takes about 90 seconds for the popcorn to start popping, which is pretty fast if you ask me! The kids of course were right there with chairs pulled up so they could all watch as the popcorn popped. On the top of the lid there is a place where you can put your butter, my batch called for 1 tablespoon around the top. 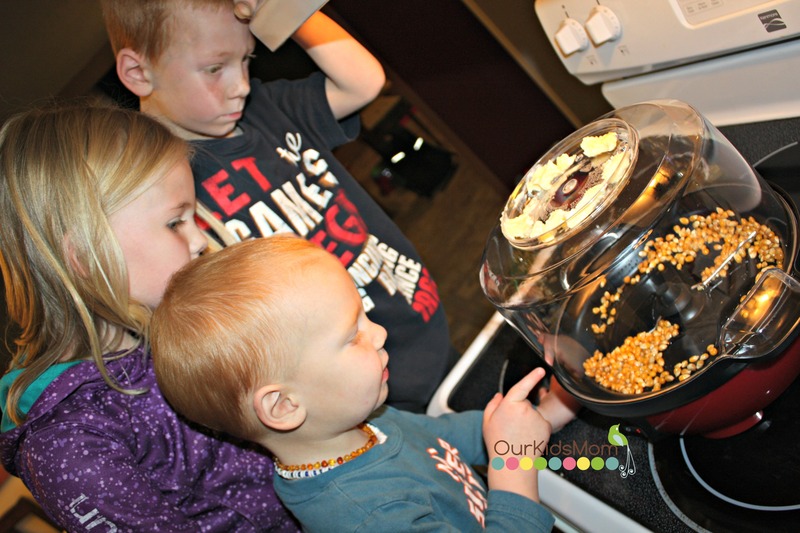 The heat from the popcorn maker melts the butter up top which drips over the popcorn. I love the idea of the butter dripper on the top but I wish it was slanted towards the holes so it would drip out easily. I had to use a spoon to scrape the butter towards the holes because it wanted to collect at the edge. 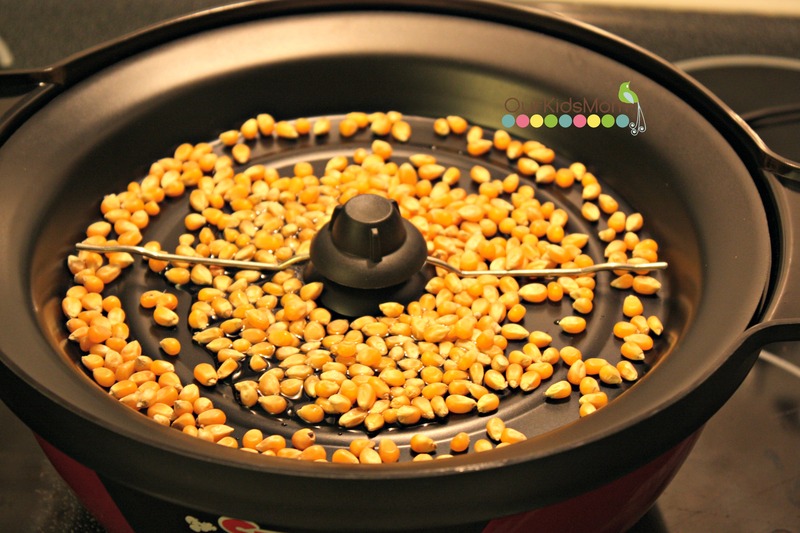 Once the popcorn was done popping, I turned the machine off, placed the lid onto the butter melter and held onto both handles to flip it over. I love that your popcorn is now in the bowl ready to eat. My kids dove right in and it was gone so fast. They loved it so much they were already asking for popcorn tomorrow. One thing I noticed, the heat plate on the machine stays hot for a little while after it’s turned off. I just made sure to put it where little hands couldn’t reach it. 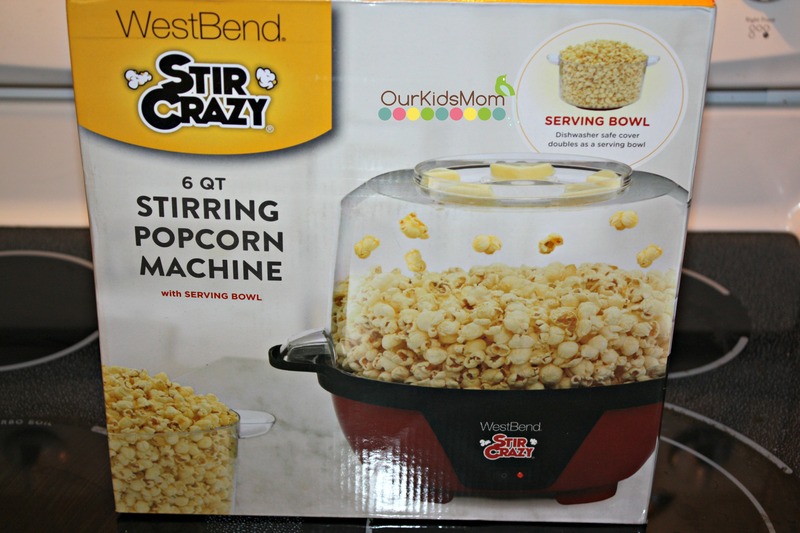 If you or someone you know is a popcorn lover then head over to www.westbend.com and check out the many different popcorn poppers they have. It’s so much healthier and cheaper then the microwave stuff.